The start of my second year in Japan marks the end of my first full Japanese summer. Summer is a fantastic time to be in Japan (despite the high temperatures and killer humidity) as it’s the height of festival season. Everywhere in Japan, from tiny towns to major cities, has its own festival, and if I had the energy I could spend every weekend watching fireworks and eating festival food. It’s a nice change from winter, which gets pretty quiet as everyone hides inside under their kotatsu. It’s hard to believe, but this week marked the one year anniversary of my arrival in Japan. I spent the day (and the past few weeks) saying goodbye to most of the friends I’d made here, who are returning home. I’ve been doing a lot of thinking about what it means to live in the vaguely transient way I’ve been doing for the past few years, and the pros and cons of making friends who live halfway around the world. One last road trip with Meagan and Eddy, who took me on too many adventures to count over the past year. The people I’ve met here have been overwhelmingly wonderful. You’ve seen many of them in my photos (though they were often behind the lens, possessing greater photography skills than me) and I’ve mentioned many of them in previous posts. While I came to Japan with the hope of making tons of Japanese friends and becoming a fluent speaker (ha! 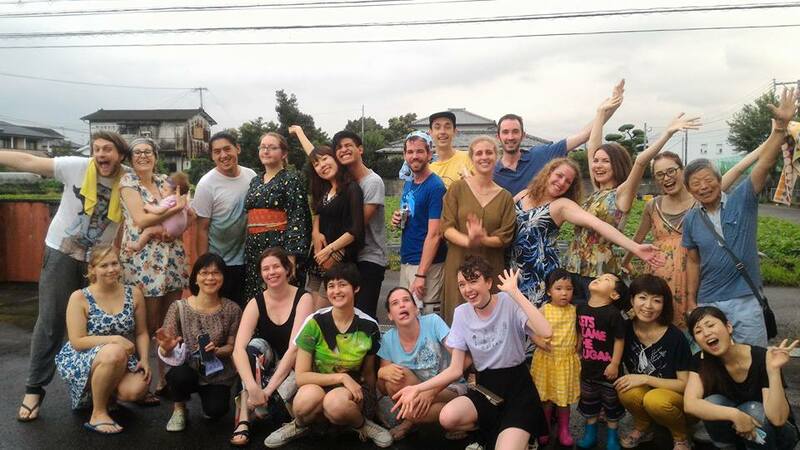 ), I was taken back by how great the community of foreigners was in my little rural town. I arrived and was met with such friendliness, so many invitations to festivals, dinners, karaoke and road trips. I remember being surprised when one morning, in my first week, a girl I’d met at the welcome party sent me a message inviting me for coffee, going on nothing but a short conversation that in my mind melded into a thousand others. She had lived here for four years, and showed me around town with such confidence that I immediately felt at ease in new surroundings. Karaoke, the group is in good form! What I lack in singing ability, I make up for in enthusiasm! My fellow first years joined me in a slight state of shock our first few months, but they proved to be great companions on many adventures. I have lovely memories of nights spent in bars talking about life in our various countries, road trips where we got lost and found and lost again, game nights full of crazy charades that inevitably transitioned into a trip to the local karaoke joint. But maybe the best memories are just of sitting around in a cafe, talking about nothing at all, panicking about what comes next, acting as each others’ cheerleaders or sounding boards. And now a year has come and gone, and I’m a resident “senpai,” an old hat, someone who’s been here and done things. Not only that, but I’ve been made a block leader, tasked with helping people find their way around, making sure the group morale never gets too low, and checking on everyone’s safety in case of an emergency. Last week the first newbies arrived, and I couldn’t believe how much I had grown and changed in a year. I realized that I actually do know my way around, that I can make my way through most situations and know how to ask if I can’t. I can drive on the “wrong” side of the road without fear, confidently order food, and explain to the taxi driver how to get to my house. I could barely imagine doing these things a year ago. So here I am, a year in, a year to go. It’s been amazing, and this coming year looks promising as well. I’m still a bit sad from all of my goodbyes, but there’s lots to look forward to in the coming weeks and months. Bittersweet goodbyes, but a bright future ahead! Japan, year two, here we go!